Perrine, The Wright Family of Oyster Bay. New York : 1923. Copy 52 of an edition limited to 210 copies, signed by the author on limitation page. This copy belonged to Arthur D Weekes of Oyster Bay and entered the Society's collection in 1990 as the gift of W. Porter Buck. Stephen M[ott] Wright. Frontispiece engraved by E.G. Williams & Bro. N.Y.
Ancestral Line of Stephen Mott Wright from Nicholas Wright the Original Ancestor, Compiled by Henry Whittemore. New York : . Stephen Mott Wright (1841-1906), New York City hardware merchant, arranged for the private publication of this short extract from Henry Whittemore's Heroes of the Revolution and their Descendants. Included is a genealogical chart of descent from Nicholas Wright, who came to Oyster Bay with his brothers Peter and Anthony in 1653. Merle-Smith, The Village of Oyster Bay: Its Founding and Growth from 1653 to 1700. Garden City : Doubleday & Co, 1953. The library's copy once belonged to former Society President Peter Fisher. The manuscript for this private printing was originally submitted to Columbia University's Faculty of Political Science in June 1950 as Van S. Merle-Smith's Masters thesis. 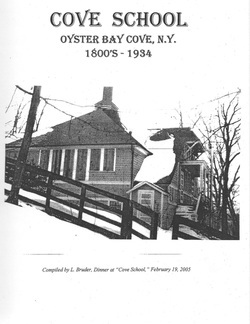 Cove School: Oyster Bay Cove, N.Y., 1800s - 1934. Unpublished manuscript compiled by Linda Bruder, 2005. This informal history of the Cove School contains photocopies of newspaper clippings, correspondence, photographs, and certificates. Although unpublished in a traditional sense, such works often receive local and even regional distribution. For more on the Cove School, see Hammond, "A Brief History of Oyster Bay Schools" on this web site's History page. 1923 Almanac and Manual of Useful Information Issued by the Oyster Bay Guardian. Oyster Bay, N.Y. : Disbrow & Son, . Harold and Jessica Kraft Collection. As a manual of useful information, the 1923 Almanac issued by the Oyster Bay Guardian contains health hints (exercise in the open air), facts and figures (August 1 is Colorado Day), wayside gleanings for the curious (the word "and" occurs in the Bible 46,227 times), and aids to beauty (a dirty skin with clogged pores is ugly). Local advertisers included the Guardian itself, whose full-page display features a Miehle press and a Linotype machine. Henry Hicks, Home Landscapes 1924: Summer Planting. Westbury, Long Island. : Hicks Nurseries [Isaac Hicks and Son], 1924. Hicks Nurseries, founded in 1853, is the oldest nursery on Long Island. Around 1900, Edward Hicks developed a method of excavating fully grown trees and transporting them to North Shore estates for replanting. The 1924 catalog illustrates this process as part of its promotion of summer planting.